Today brought another early end to the work day for me due to Oregon inclement wintery weather. When I got the notice from my University’s President that we could leave at 3:30, I immediately started to think about what wine I could possibly pass the time with this evening. I arrived home and let most of the afternoon and evening pass me by doing a little bit of work at home before I decided it might get too late to really enjoy the wine if I didn’t just pick one. Anyone who knows me knows that picking a wine to drink is a task that could be quite time consuming. I have to decide if I want a Northwest wine or not? Do I want a domestic or international? Don’t get me started on deciding between red vs. white. So after about 15 minutes (the clock was ticking against my favor), I decided I would open a bottle from a neighboring winery. 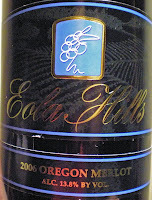 This evening I decided to open a 2006 Oregon Merlot from Eola Hills Winery. Eola Hills located about 10 miles west of Salem, and while it is literally a 15 minute drive from my front door to the winery, I have not been there. I have driven by it many times and made the mental note that I should visit, but after living in the area for about a year and a half, it had not yet happened. Unfortunately, that does not allow me to tell you more about Eola Hills than what is available on their website. I opened this Merlot and let it breathe for about 45 minutes before I poured the first glass. The color is one that is a rich red-grape in hue, not very transparent to the light. The nose was strong, but not overpowering. I could easily smell the “smokiness” with each whiff. There are light hints of fruits, but I am unable to detect exactly which ones are there. The first sip was surprisingly fruity, again, not overbearing, but clearly noticeable. As I took each supplemental sip, I imagine the flavors landing on my tongue, then spreading out evenly for a very full flavor. After a while, there is a light aftertaste that I am not completely able to describe. The aftertaste is strong initially, and then subsides. I cannot put my finger on what it is, which I am finding quite bothersome, hoping that it will come to me in the middle of the night perhaps. I would encourage anyone of you to try this Merlot, not to be confused with the 2005, and submit your thoughts on how you would describe the aftertaste. This is a very enjoyable wine and I highly encourage you all to try it as it could possibly be among my top 10 favorite wines. I tried mine. The 2005 was very nice with dinner - shrimp linguini in marinara. The bottle aired for less than an hour. I drank with my buddy. His name is Buddy. We could not agree on the aftertaste. I said it was bitter huckleberry and then mellowing to dark cherry. He said it was an immediate aftertaste of ripe musky melon- then, yeasty rye bread.